Because I don't have enough hobbies, between spinning, knitting, beekeeping, quilting, gardening and motorcycles, I decided to volunteer my time as a docent at Rock Ledge Ranch. That's right, volunteer, as in not get paid, donate my free time, work for nothing. 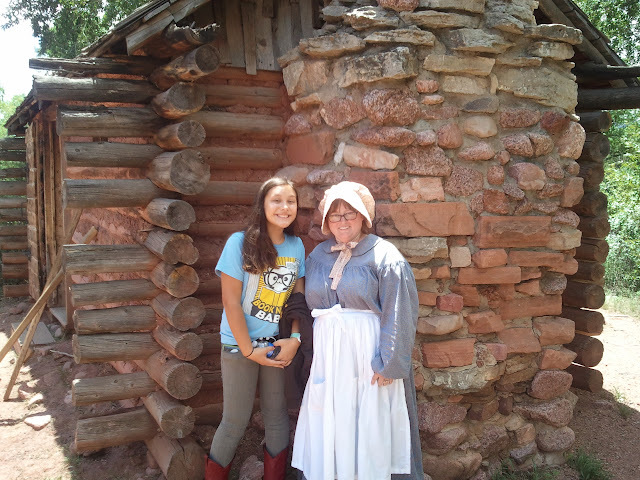 Rock Ledge Ranch is a city park that acts as a living history museum. I've been out there before during a craft fair but hadn't really thought about it again until some women came to my quilt guild asking for volunteers. One lady was promoting Quilting Friends of Rock Ledge Ranch, whose main function is to make products that can be sold in the general store either as a fundraiser for Rock Ledge, or under consignment. This sounded interesting, but they meet during the work week when I have to, well, work. The second lady was there as a city employee, in charge of the docent staff, trying to drum up volunteers. I don't know what I drank that night, but somehow my name got written down on some paper and I came home with some informational fliers. I attended two training sessions, then they let me loose on some real people (they never learn). I am a docent for the 1860's Galloway Homestead area. I wear period appropriate clothing, speak appropriate to the time period (For those of you who know me well, this is incredibly hard. Apparently only whores and outlaw women swore the way I normally do. I'm going to ignore what this says about me. ), and perform period appropriate tasks. What does this mean? Well, I volunteered as a quilter, so my main focus was to sew and quilt something that was popular during the 1860's and 1870's. I picked out several post Civil War era patterns, chose some beautiful reproduction fabrics, and pre-cut my strips using my rotary cutter (I'm reenacting history, not stupid). Then I realized that hand sewing a large project could take a long time, especially if I'm only sewing on it during my docent shifts. It was actually the Junior Docents that gave me a great idea. To keep the project small and allow others to easily participate, I decided that doll quilts were the way to go. The strips became squares, easily packed in a sewing basket, along with a pincushion of pre-threaded needles. I enjoyed sitting outside the homestead cabin, under a tree, sewing my squares together, teaching the junior docents and any visitor who wanted to try. My other interests, aka time-consuming hobbies, mesh surprisingly well with the time period also. I bought some 100% wool yarn and wooden knitting needles and have been knitting a scarf during my docent shifts. Several children have asked to try, and I've got another pair of needles all set up for them. I've also brought along some undyed BFL (Blue-face Leicster) wool fiber and a simple wooden spindle and spun some yarn up. RLR actually has some merino sheep, which they shear in the spring on opening weekend, so it's fun to tie it all together. In addition to demonstrating these crafts, we cook (sometimes) over fire, saw logs for firewood, work in the homestead garden, or my favorite, hang out with Patches the Guernsey cow. I've enjoyed my first season at RLR, and I'm looking forward to next year.